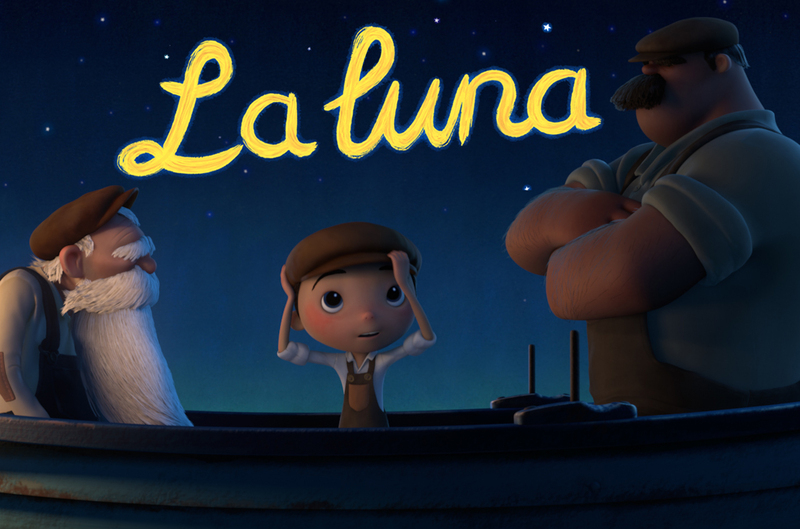 The latest Pixar animated short La Luna , written and directed by Enrico Casarosa, is nothing short of a masterpiece. La Luna is the longest ever Pixar short at 7 minutes, and is featured at the beginning of Disney/Pixar’s Brave .There is a reason why this short has already been nominated for a 2012 Academy Award for Best Short Film, Animated and 2012 Annie Award for Best Animated Short Subject. I am an astrophysicist by training, so its likely that anything with stars and the moon is generally to get acclaims from me, and while obviously not scientifically accurate, this story has the making of a legend. La Luna is a touching coming of age story of a young boy. Bambino’s first night working with his father and grandfather is exciting to say the least. On a very dark night, Father and Papa row the trio far out to sea to the middle of nowhere where they stop and wait. When Bambino discovers his family’s custodial line of work is far from ordinary, he must chose between the traditions of his father, grandfather, or find his own niche in the family business. Beginning with Pixar’s second feature length film, A Bug’s Life , a Pixar short has always been shown in theaters before the film starts. Pixar shorts that don’t make it to the big screen generally end up on home media releases and showcase Pixar’s technological and cinematographic skills. Of the 21 previously released Pixar shorts, only three have ever won an Academy Award, Tin Toy (1988), Geri’s Game (1997) and For The Birds (2000). La Luna easily matches the quality of those three previous winners. Pixar has also created several short series that aren’t part of the Pixar short list. These include Cars Toons (2008-present) and Toy Story Toons (2011-present). Pixar has also created a lengthy list of educational background content that is released with their feature length films, again these aren’t counted in the 21 shorts that Pixar is best known for. If you are as in love with Pixar shorts as I am, you will love that Pixar has released its first volume collection of shorts complete through 2006’s Lifted on Blu-Ray and DVD . Rumors suggest that Pixar is expected to release its second volume in November 2012, but there has been no official statement from Disney or Pixar on the matter. For the Birds 2000 Monsters, Inc. Monsters, Inc.